This the second in our series of podcasts of recordings made at ALDC’s Local Solutions 2009 conference on Saturday in Sheffield. You can listen to Nick Clegg and Ros Scott in the first instalment. For the second hour, the leader of Sheffield city council Cllr Paul Scriven gave delegates a detailed explanation of how the Lib Dems won Sheffield – and most importantly of all, what they did with the power once they had it. It’s an inspiring story of decentralisation and empowerment of the local citizenry and is well worth forwarding around any of your colleagues who want to know what a difference Lib Dems can really make. You can listen to the sound file right here on the web, or you can download it for use with your MP3 player. Why not listen to the conference next time you’re out delivering leaflets? If you use iTunes you can search the podcast directory for Lib Dem Voice; for other podcast software, you can use this RSS feed of LDV’s audio content. Tomorrow’s instalment is a session by Mo Baines of APSE on the carbon reduction commitment for public authorities. 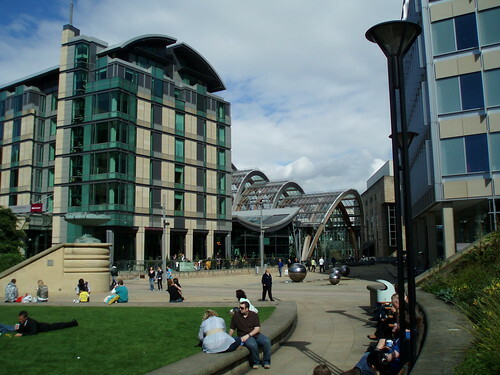 Read more by Alex Foster or more about aldc, local solutions, paul scriven or sheffield. What happens when you change your email address? I may be being dense, but where is the link to download the podcast? Er, um, you weren’t being dense. I’m sure it was there last night when I wrote the post, but somehow managed to drop off by itself during the night. Grr. Great stuff and very interesting. But very difficult to hear (echoing sound with highest and lowest frequencies chopped off and middle frquencies often peaking above the channel capacity). Pity. But how can I get a transcript of what was said on area committees? Yeah, the sound is far from perfect – partly because I left the sound recorder unaccompanied in the main hall while I was at another fringe. If I’d known Cllr Scriven wasn’t going to use the PA system, I’d have adjusted it differently and put it in a different place. I have subsequently amplified it a bit, but am not expert at sound manipulation, so that has resulted in clipping in the louder bits. Tony – there is no transcript that I am aware of but Cllr Scriven did provide a handout that can probably be obtained by contacting his office at Sheffield. Or if you ask nicely we might find someone here with the time to transcribe. The gist, from my memory, is this: spending on key local services like libraries, parks, street cleaning and sweeping is devolved to area committees. There is also discretionary money allocated. Every area ctte gets basic money and the most deprived areas get additional funds on top. After that, the spending is entirely determined by the ctte, which has powers to transfer its budget from existing services to alternative ones or even new ones. So library opening hours, park maintenance schedules, etc are all determined locally. This gives something real for non-executive councillors to do and means local communities can see exactly where decisions are made. Not quite sure what safeguards are in place to ensure that decisions are consistent – how do stop a bunch of library fans turning up one month and switching funding to libraries, only for park fans to turn up the next and switch it back? !